For our Reader’s Choice: Egg Roll, you voted and the Black Bean Burrito Roll won. I changed the name but it’s basically the same concept. 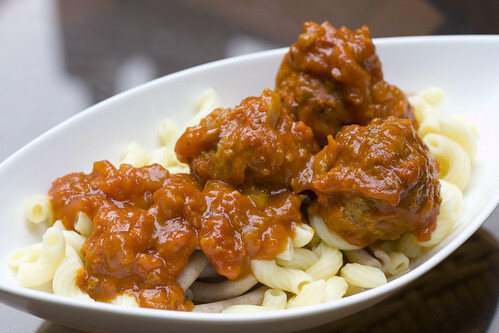 It has a couple of different components, so feel free to just use parts of this recipe. The Chipotle Rice that Lon made, is a nice side dish with some heat. The Black Bean Corn Salsa is an easy and colorful accompaniment for any barbecue or picnic. 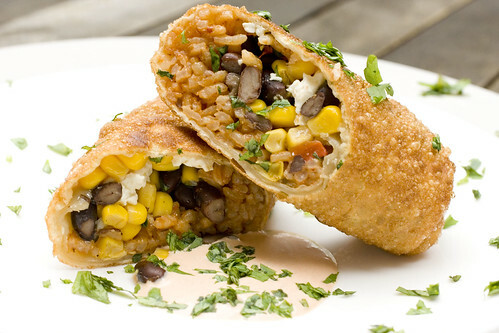 If you have time, put it all together, and have a fun Tex-Mex inspired Egg Roll. The Cotija Cheese, which I first heard about at The Duo Dishes, was a perfect match for this dish. It’s crumbly and doesn’t melt, but softens nicely, adding a nice salty milkiness. 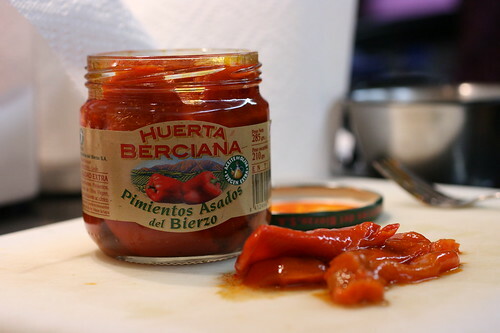 I didn’t realize until I opened this jar of Pimientos, from our Despana Basket, that it was packed in olive oil. I normally buy the ones jarred with brine. 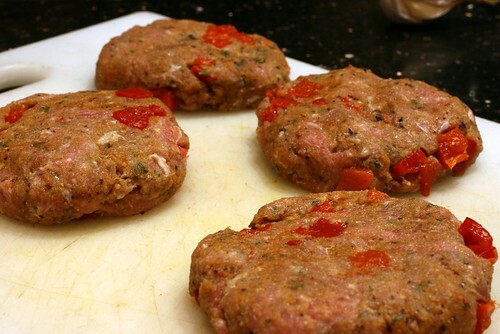 The olive oil does add a bit of flavor and the fat coats your tongue nicely if eaten alone. I’m not sure it makes a big difference when cooked in a rice dish. It certainly doesn’t hurt though. I wanted to make a quick one-pot meal tonight, having stood all day, and just not in the mood for experimenting. Lon just came in from the pouring rain, completely soaked, and I wanted something comforting, guaranteed to warm him up. Well, this dish worked, a cheaper and easier version of Paella, because these are the ingredients I had. We finished the whole thing, which was really meant to be dinner and his lunch for tomorrow. 1. Heat oil in a 11″ skillet (2 1/2″ deep) over medium high heat. Add onions & cook until starting to soften, about 2 minutes. 2. Add chicken. Season with salt and pepper and stir until the outsides of the chicken pieces are cooked, about 2min. 3. Add chorizo and stir for another 2minutes. 4. 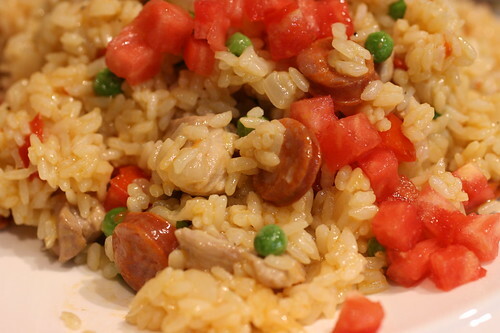 Add pimientos and rice, stirring until rice is coated with oil and pan juices. 5. Stir in two cups of chicken broth and bring to boil. Reduce to a simmer and cook covered until liquid is absorbed, about 12 minutes. 6. Stir in frozen peas, which will cook in less than a minute. 7. 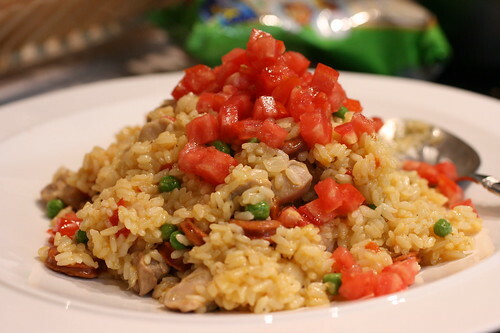 Remove the rice dish to a serving platter and toss tomatoes on top.